Map-Me ("Mapping Meanings") is an online Participatory GIS (PPGIS) for the creation of online surveys for the collection of vague spatial data. Based upon a "spray and say" approach, Map-Me uses an 'airbrush'-style interface (the "Spraycan") to allow participant's to "spray-paint" on to a Google Map in order to answer vague spatial questions (e.g. "Where you think...?") without being required to enforce precise boundaries onto their data. This approach is designed to be more reflective of the way in which people think about the world, and so creates a richer and more representative dataset than is possible using traditional point, line and polygon-based approaches. If you are already a Map-Me user, or you would like to register, click below to get started. 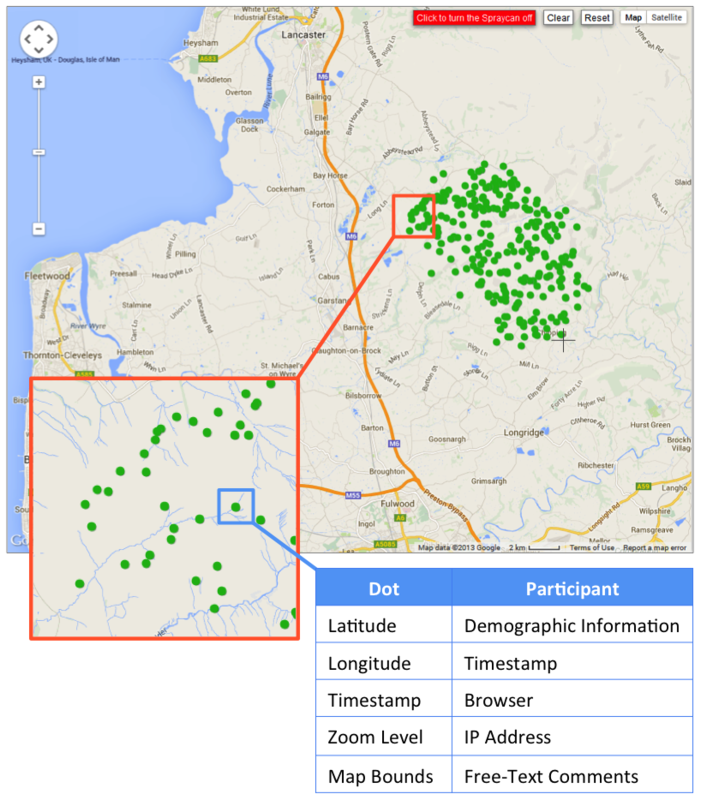 Map-Me uses a custom "Multi-Point-and-Attribute" data format, whereby each individual dot of paint is stored independently in the database, and is linked to several attributes. Please see the Huck et al. (2014) paper for more information. These data can be used to explore a wide variety of personal geographical information, such as in the below interactive map, which shows areas that are considered to be Catholic, Protestant or mixed by local residents (courtesy of the Belfast Mobility Project). The 'dots' of spray are sized according to the zoom level of the map onto which they were generated, and are coloured using a subtractive colour model in which overlapping colours 'blend' together allowing interactions between the different classes to be seen (e.g. cyan + magenta = blue). This means that areas of disagreement between the different classes can easily be distinguished by the reader (There is very little disagreement in the below map, because the community divisions in this part of Belfast are widely understood). More information about this project can be found in Huck et al. (2018). Huck, J., Whyatt, D., & Coulton, P. (2014). Spraycan: a PPGIS for capturing imprecise notions of place. Applied Geography, 55, 229-237. Though this manual is now somewhat dated, it still provides a useful overview of the Map-Me platform and the analysis of data collected using Map-Me. Huck, J. (2012). Map-Me User Manual. Huck, J.J., Whyatt, J.D. Sturgeon, B., Hocking, B., Davies, G., Dixon, J., Jarman, N. and Bryan, D. (2018). Exploring Segregation and Sharing in a Divided City: a PGIS approach. Annals of the Association of American Geographers. Huck, J., Whyatt, D. & Coulton, P (2015). Evaluating the spraycan: understanding participant interaction with a PPGIS. In Proceedings of the 23rd GIS Research UK Conference. Huck, J., Whyatt, J.D., Yielding, S., Stanford, H. & Coulton, P. (2013). Development and application of a "spray-can" tool for fuzzy geographical analysis. In Proceedings of the 21st GIS Research UK Conference. Carver, S., Watson, A., Waters, T., Matt, R., Gunderson, K. & Davis, B. (2009). Developing Computer-Based Participatory Approaches to Mapping Landscape Values for Landscape and Resource Management (2009). In S. Geertman, and J. Stillwell (eds. ), Planning Support Systems Best Practice and New Methods, pp. 431-448. Springer. Evans, A.J. & Waters, T. (2007). Mapping vernacular geography: web-based GIS tools for capturing "fuzzy" or "vague" entities, International Journal of Technology, Policy and Management, 7(2): 134-150. Waters, T. & Evans, A.J. (2003). Tools for web-based GIS mapping of a "fuzzy" vernacular geography. Proceedings of the 7th International Conference on GeoComputation. 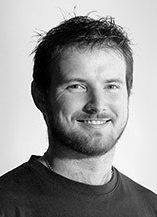 Jonny is a Lecturer in Geographical Information Science at the University of Manchester. He has extensive experience in geospatial software development and cartographic design, and his interests include the representation of vague geographical entities and novel approaches to cartography. He is the lead software developer for Map-Me. Steve is a Geographer and Senior Lecturer at the University of Leeds. He has 25 years' experience in the field of GIS and multi-criteria evaluation with special interests in wild land, landscape evaluation and public participation. He has worked extensively on the development of wild land mapping and evaluation methodologies and has tested and applied these across a variety of locations and spatial scales including Scotland, England, Britain, Europe, and the USA. Alan joined Forest Service Research in 1988 and has directed the social science program both before and since transformation of the US Forest Service Wilderness Research Work Unit to the Aldo Leopold Wilderness Research Institute. Alan has represented the Leopold Institute three times on Fulbright appointments (Finland, Russia and Brazil), serves on the Editorial Board of the International Journal of Wilderness, and he represents the Leopold Institute and partner agencies on the Executive Committee of the World Wilderness Congress. Grateful thanks to David Gullick and Dan Burnett for their invaluable help in the development of this software. Thanks also to Duncan Whyatt and Paul Coulton for their support in the development of the platform. Map-Me originated from an idea originally posited by Andy Evans and Tim Waters at the University of Leeds.